[Stride]-Stride Step-[Choose one or more cards with the sum of their grades being 3 or greater from your hand, and discard them] Stride this card on your (VC) from face down. [AUTO](VC):[Counter Blast (1) & Choose a face down card from your G zone, and turn it face up] When this unit attacks, you may pay the cost. If you do, choose up to two locked cards for each face up card named "Genesis Dragon, Flageolet Messiah" in your G zone, and unlock them. If the number of units unlocked with this effect is one or more, choose any number of locked cards, and those cards cannot be unlocked during that player's next end phase. If a total of three or more units were unlocked with this effect, this unit gets [Critical]+1 until end of that battle. Freedom! It's time to start reviewing what many consider to be the worst G Booster's cards! Flatulence Messiah is first. Upon attack, you CB1 and flip any G Zone card face-up, and then for every Flageolet in the G Zone face-up, you unlock up to 2 locked cards. If you unlock at least one, you can Omega Lock as many cards as you want. If you unlock at least 3 with this skill, this gains +1 Critical until end of battle. I once saw a deck online that sought to use this in quite possibly the most horrible way imaginable: Dark Zodiac. 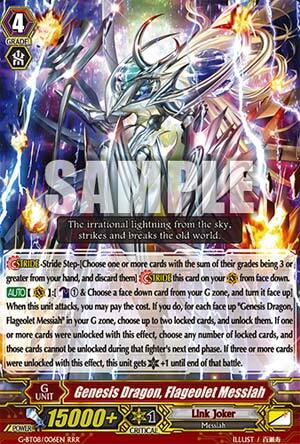 Triangle Omega Lock, then just spam this over and over for about 4 turns straight, never letting any of their rear-guards attack. Oh yeah, in Messiahs this is functional enough too I guess but the above combo has more room to spam this in a positive way. Unfortunately that means Excelics will appear a turn later than you'd like but being able to stave off more attacks to combo with Arestor Messiah and his ilk is good. Only has any meaningful use in Zodiac and Messiahs but I guess you should be thankful this Messiah can be used anywhere else at all. Well, Captain Crunch Dragon just got kicked out of Messiah.dek's G-Zone. The new Messiah on the block makes for an excellent first stride, because you're really aiming for some Omega Locks on your opponent rather than his extra critical. You've got two other Messiahs that can make their own crits as well, and push for game a bit harder. Of course, in Link Joker mirror matchups, this guy just adds to the situation of "neither player can actually keep the other down." Now, Flageolet can be used in the mirror match instead of having to burn through all your Amnesty Messiahs. Since Flageolet has no heart restrictions, in Star-vader or Deletor decks, you run some copies of Flageolet to unlock your board after your opponent locks you on their turn. Not much else to say: stride into this guy first in Messiah.dek and frustrate anybody who's not running Grade 4 Ezel. It's nice that Flageolet is both good and a non-Generation Rare, cause one needed serious bank to construct a competent Messiah deck before G-Set 8. In Messiahs, you might as well run 4 Flageolet, unless you're running some weird hybrid with Star-vaders or Deletors, and in that case...why. In Star-vader and Deletor decks, you can get by with 2 or 3 since you only take advantage of Flageolet in mirror matches.